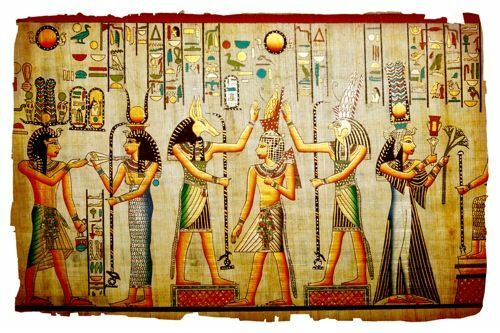 The almost infinite varieties of representation of the numerous divinities which have been found in ancient Egyptian monuments have led to a gross misunderstanding about the religion of the Ancient Egyptians. The religion of ancient Egypt which one is tempted to think of as polytheistic, was in fact, like all the great religions, monotheistic. Today scholars are agreed that the many divinities found in Egyptian temples are to be considered as attributes or intermediaries of the Supreme Being, the One God, the only one recognized and worshipped by the priests, those initiates or wise men of the sanctuaries. At the pinnacle of the Egyptian pantheon there stands a God who is unique, immortal, who was not created, who is invisible and hidden in the inaccessible depths of his own Being. Begot by himself from all eternity he absorbs in himself all divine characheristics. It was not gods that were worshipped in Egypt but, under the name of whatsoever deity, the hidden God who has no name or form. A single idea dominated everything, that of a God who is one and primordial. The Egyptian priests defined him thus: « He who is begotten from himself; the Principle of all life, the Father of fathers, the Mother of mothers » and they also said « From him comes the substance of all other gods » and « It is by His will that the sun shines, that the earth is separated from the firmament, and that harmony reigns on all creation ». However to make the belief in the One God more understandable to the Egyptian people, the priests expressed his attributes and his various roles by means of subtle representations. The most perfect image of God was the sun with its three attributes: shape, light and heat. The sun’s soul was called Amon or Amon-Ra, a name which means « hidden-sun ». He is the father of life and the other divinities are only the different parts of his body. We can now introduce the famous Egyptian triads. Ad the masters of this ancient theogony tell us the Supreme Being, the creator of the universe, is unique in his being but not in his person. He does not come out of himself to beget but the begets within himself. He is at one and the same time the Father, the Mother and the Son of God without leaving God. These three persons are « God in God » and far from destroying the unity of the divine nature together they engender his infinite perfection. The Father represents creative power while the Son, image of the Father, strengthens and manifests his eternal attributes. Every Egyptian province had its own triad, all interrelated, but this more compromised the divine unity than the division of Egypt into provinces compromised the unity of the central government. The principal or great triad was that of Abydos which consisted of Osiris, Isis and Horus. It was the most popular and was worshipped throughout Egypt because Osiris personified Good and was popularly known as the « good God ». The triad at Memphis consisted of Ptah, Sakh- met and Nefer-Tum, that at Thebes of Amon, Mut and Khonsu. 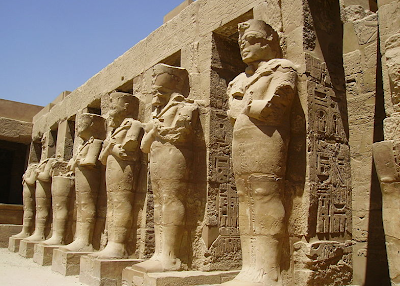 The Trinity was not the only dogma which Egypt had retained from primitive revelation. In the holy books one also finds original sin, the promise of a redeeming God, future restorations of humanity, and the resurrection of the flesh at the end of time. At each change of dynasty there was a monotheistic revolution and the Supreme Being prevailed over the fetishism of the other divinities. The religious revolution of Akhnaton had been preceded by that of Menes, not to mention that of Osiris (5th millenium B.C.). According to some historians during the reign of Osiris, king of Thebes, (4200 B.C.) a complete change in religion occurred. This king, the most devout of all, succeeded in getting monotheism adopted on a wide scale. It was this same Osiris, defied, who reigned over the supreme court for the judgement of the souls of the dead. According to the rite of « psychostatis » (meaning « weighing of the soul », i.e. the ceremony of final judgement of the deceased), the soul of the dead person was carried on a sacred barge over the waters of the Elysian Fields. As the barge passed it brought light to those regions inhabited by the souls of the damned who trembled with joy at the sight of a little of that light which was now denied to them. The barge continued its journey and after crossing a lighter zone, corresponding more or less to our purgatory, finally reached the supreme court presided over by Osiris and his fourty two assessors. The heart of the dead person was placed in one pan of a balance while in the other was placed a feather, symbol of the goddness Maat. If the dead person had done more good than evil then they became one of the « true of voice » and thus a part of the mystical body of the god Osiris. If this was not so the heart was eaten by an animal with the head of a crocodile and the body of a hippopotamus and ceased to exist in the Other World. A soul which had thus been « justified » was then admitted to Ialou, the Elysian Fields. At this point one may well ask why so many everyday objects are found in the pyramids and tombs. 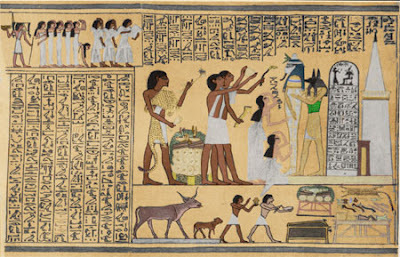 It should not be forgotten that the fundamental religious idea of the Ancient Egyptians was that human life continued even after physical death. But only those who continued to enjoy what they had enjoyed in the life could attain the Other World. Hence the house furnishings, the food, the drink, the servants and the other objects necessary to everyday life.